Since December my diary, and my mind, have been rather occupied with the Government’s “Infrastructure Bill.” This might sound rather technical. But I know from the number of local people who have contacted me about the various issues covered from the Bill – from fracking to cycling and the Highways Agency – that it is hugely important. So although it has been hard work, and it has taken a considerable amount of hours to prepare for facing the Government at the despatch box and debate proposals in ‘Committee’, it has been a real privilege to lead the Labour Party’s scrutiny of this Bill. I know that people here in the Northfield area want access to good housing, affordable energy, fast broadband and mobile connections and a modern transport system that provides them with connections to jobs, opportunities and friends and family. Infrastructure is vital for our economy and our quality of life. But the UK faces huge infrastructure challenges over the next few decades. Our population is set to rise to 73 million in 20 years, there is a chronic shortage of affordable homes and our energy, road and rail networks are struggling to cope. You only have to look at the potholes and congestion on local roads, and the stations in Northfield, Longbridge and Kings Norton to know we need change. But the Government’s Bill, which MPs debated at it’s final Report Stage on Monday 26 January 2015, was wasted opportunity. Crammed full of piecemeal measures, I have been saying that it was just not what our country needs to face the future with confidence. The Tories didn’t even want to give Parliament the time to discuss it properly. It is a sign of their approach to infrastructure that they gave a Bill containing reforms on roads, fracking, energy, housing, property searches and planning for community pubs just a few hours of debate on Monday. Thankfully along with Labour’s Tom Greatrex MP from the Shadow Environment and Climate Change Team, and Roberta Blackman-Woods MP in the Shadow Local Government team, I used that time to push for badly needed improvements. With eight of ten homes still reliant on gas for heating, shale gas may have a role in improving our energy supply and reducing carbon emissions in the future. But over the past few weeks I have been contacted by scores of local people who have serious concerns about the environmental and safety implications of fracking. Labour have always said that shale gas development cannot go ahead unless there is a robust regulatory regime in place. But the Tories and Lib Dems repeatedly ignored people’s genuine and legitimate concerns over shale gas and seemed prepared to plough on at any cost. So the recent vote on fracking regulation was a huge u-turn by the Government and a huge victory for Britain’s environment. Thanks to Labour’s amendment shale gas developments will now be prevented unless the proper safeguards are implemented. And it will be banned outright in national parks and other protected areas. We have worked hard to secure the robust regulation of fracking that the public want to see. 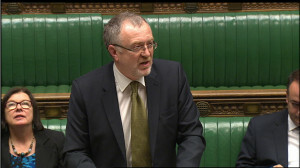 Our efforts over the past month – in two debates in the Commons Chamber and many more in Committee – have also ensured the Government backed down from half-baked reforms to mobile communications infrastructure, got a commitment to increase apprenticeships and training in the construction sector, and helped secure the legal obligation to support walking and cycling that so many local residents have written to me about. But the Government’s Bill goes nowhere near to delivering the infrastructure we so badly need. The Tories have presided over the UK’s lowest housebuilding levels since the 1920s but failed to back our proposals to free up more land for development. Their Bill has watered down the commitment to reduce carbon emissions in new homes and failed to address urgent air pollution problems caused by road traffic too. I have continued to press the Government to deliver the road improvements I know that local people want to see. All year round people get in touch with me with complaints about traffic, potholes, parking and safety on the local roads that they use everyday. But Tory Ministers seem to think that a top-down reorganisation of the Highways Agency, that runs just 2% of strategic roads in the country, is more important than fixing Britain’s broken roads. One constituent got in touch with me to say “I have major concerns about the ill thought out proposals which will do nothing to assist the UK economically and will be of great concern to road users.” I couldn’t have said it better myself. Thankfully Labour’s pressure has secured a greater priority for local roads and in the Bill, ensured that the public will be able to properly scrunitise this new government-owned company – and secured important protections for employees who will be affected by the change too. The Bill has finished in the Commons and will move to become law by the Spring. But there remains a gulf between the Tories rhetoric on infrastructure and their record on delivering the modern, low-carbon future that we need. A Labour Government has committed to deliver 200,000 homes year by 2020 and decarbonise our power sector by 2030. As recommended by the Chairman of the Olympic Delivery Authority Sir John Armitt we would also set up a National Infrastructure Commission to better plan and deliver the transport, housing and energy schemes for people in South Birmingham – in line with our climate change targets. After having debated these vital issues with Conservative Ministers over the past month I have never been more convinced that a Labour Government is needed to deliver the long-term approach to infrastructure that the UK so badly needs.